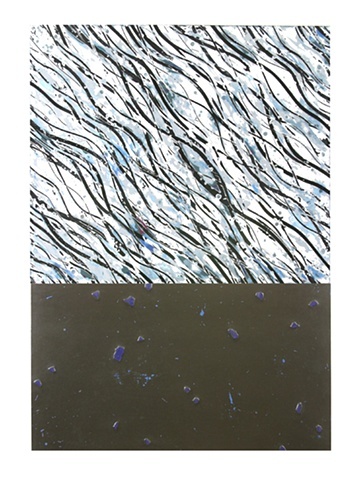 Delos Van Earl Studios - "Big Waves / Black Sand"
"Big Waves / Black Sand"
Beautiful interplay of blue, white and black in the lines of the top portion of this piece, along with embedded seeds and eggshells for texture. In the bottom portion, bright blue spots under pieces of sanded bottle glass shine like agate in black sand, with spots of turqoise accents. "Black Sand Beach" is sold.